It’s that time again! The beginning in which we remind ourselves to watch and be vigilant and wait with hope for the coming of Christ! Our first readings are now full of prophecies from prophets born hundreds of years before Jesus Christ and our gospels are full of reminders to constantly watch and wait! Which is why it’s very fitting that many of the pictures for Advent tend to connect the Old and the New Testaments together! For today, I’d like to show off a contemporary religious artwork by Sister Grace Remington, OCSO, from the Sisters of the Mississippi Abbey in Dubuque, Iowa. AND. You can get this print as an Advent/Christmas card to directly support their abbey! 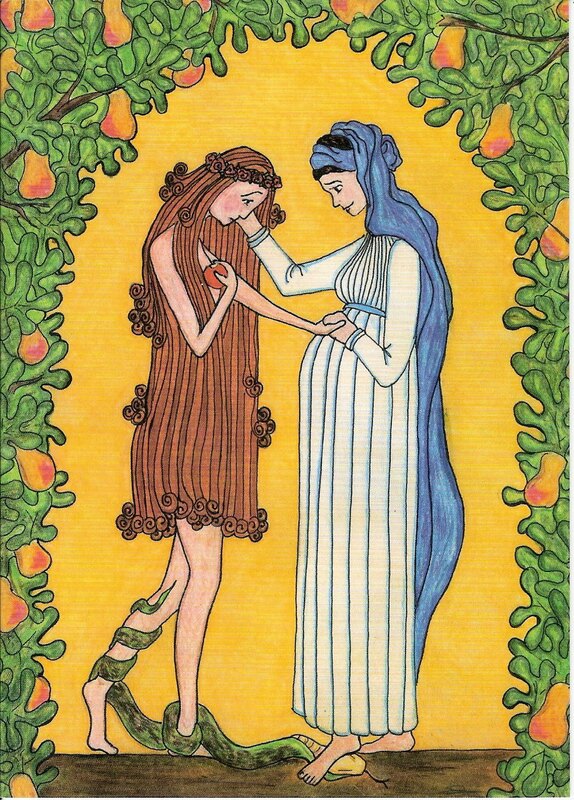 Mary and Eve, by Sister Grace Remington, OCSO, from Sisters of the Mississippi Abbey in Dubuque, Iowa. Copyright to Sister Grace Remington. For more information about buying this as a print or Christmas cards, go here. I love the reminder of hope that Mary is showing Eve by letting her touch her pregnant belly. It is as if she is reminding Eve that the Lord is indeed present in their midst, and not only that but will redeem them. Though Eve definitely messed up by listening to Satan, who was in the form of the serpent, she does not have to be imprisoned by him forever. The Lord will come and save all. I love how the forbidden fruit seems to surround them entirely, and yet Eve and Mary share that special moment together, ignoring the fruit and just spending time with each other. On a day-to-day basis, we are constantly surrounded by temptations to sin. And yet, this picture reminds us that all the temptations in the world cannot compete with that personal relationship that we can have with the Lord through the Church. 15I will put enmity between you and the woman,and between your offspring and hers;They will strike at your head,while you strike at their heel. Anyway, if you are interested in getting Christmas cards (or prayer cards or prints!) from the Abbey with that art (and, come on, why wouldn’t you be?!) you can go to their website and by the cards or other merchandise here! If you’ve already ordered your Christmas cards (guilty), but would like to support the Abbey anyway because of all the good work they do… no problem! They sell legendary chocolates and caramels as well! And they also have some pretty cool books too and a bunch of other neat things… check out their stuff! In what ways do you feel spiritually comforted? Part of the reason why Mary allows Eve to touch her pregnant belly is to remind Eve that the Lord is with them. In what ways do you feel Christ’s presence in your life? In the picture, the serpent is wrapped up tight around Eve’s legs. What sins have you wrapped up tight? Comfort us in our afflictions. Remind us that Your power is greater than Satan’s and let us cling to You in Your mercy. ← I Won a Rosary! Karina! Your book is truly the most beautiful work of art I have ever had the pleasure of owning much less ever holding in my hands! It is just lovely!! I love you bio in the book, made me smile, so like you! I am eternally thankful that God has blessed us with you and your family in our Parish community! It goes without saying but I am absolutely sure your book will be a first among the classics for the Rosary! Thanks for gifting us all with the opportunity to purchase such a lovely book!